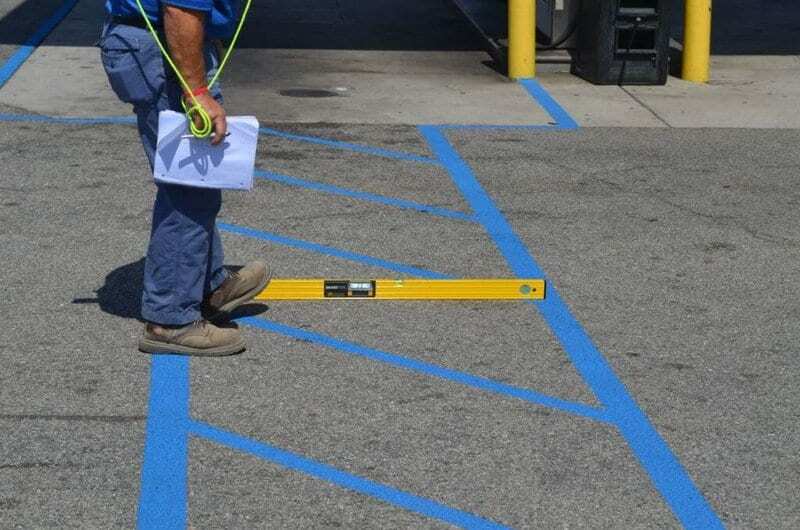 Regulations state that whenever you alter, re-stripe, repave, or construct your parking lot, you need to ensure you have the minimum amount of properly marked handicapped spaces to be in compliance with the Americans with Disabilities Act. Your building entrance and obstacles in between handicapped spaces also must comply with the ADA guidelines. No matter how many handicapped spaces that you are required to have, your first handicapped space must comply with the van accessibility requirement and be labeled accordingly. The amount of ADA-compliant spaces that you are required to have will depending on how many total parking spaces are in your parking lot. – If you have less than 100 total parking spaces in your lot, then you are required to have one handicapped space for each 25 parking spaces. – If there are 100 to 150 spaces in your lot, then you will be required to have five handicapped spaces. – If there are 151 to 200 total spaces in your lot, then you must have six ADA-compliant spaces. – If there are 201 to 300 total spaces, then you are required to have seven handicapped spaces. – If there are 301 or more parking spaces, then one of every eight is required to be ADA-compliant. In terms of size, accessible parking spaces are required to be a minimum of 8 feet wide. All ADA-complaint spaces are required to have an access aisle that is at least 8 feet wide for van-accessible spaces and for automobile-accessible spaces at least 5 feet wide. The access aisle is required to span the whole length of the space and must not intrude into it. An access aisle may be shared by adjacent parking spaces. Handicapped spaces are required to provide access to a building via the most direct and shortest route. Curbs in the path are required to have a ramp, however the ramp must not intrude into the parking space or access aisle. If this route crosses a vehicular traffic path, then there must be clearly marked crosswalks. With the exception of New York, all states used the international symbol that denotes handicapped access. It is the familiar image of an individual in a wheelchair; it has a dark blue background and the occupant and wheelchair are both white. The image can be painted on the pavement but there must be a permanently affixed sign installed on the front of this space; also the sign must state that these spaces are "van accessible." The bottom part of the signs are required to be placed so that the whole sign is visible over the vehicle's hood. Access aisles are required to be clearly marked to that others do not park over them. The aisles need to be marked on each side of an accessible space. State or local law specifies the color of the aisle markings, but no specific color is required by the ADA.